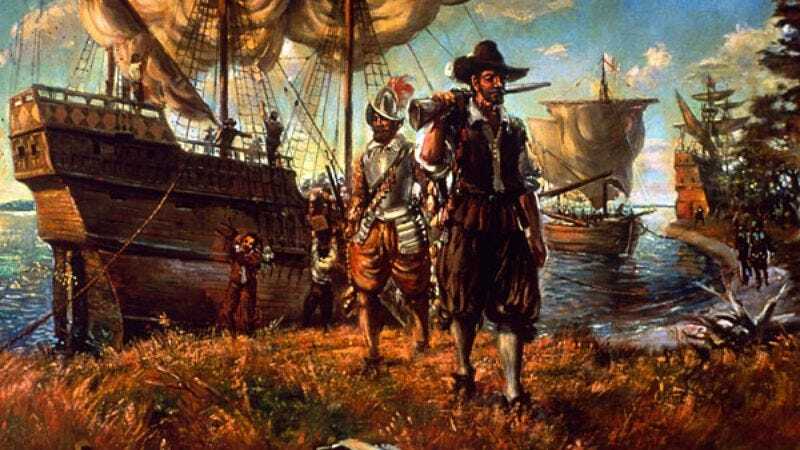 On Sept. 16, 1620, a group of Puritan Separatists took to the sea in hopes of escaping persecution from soccer and its ardent followers, specifically those who would not allow the Pilgrims to live a life in which they could openly reject traditional soccer practices. "Fundamentally, what they sought in the New World was freedom to practice any sport they wished," historian and author Bruce Wright said. "The Pilgrims thought people should not be forced to conform to one single game, especially one in which the hands went unused." "We must keep in mind what these radical Puritans believed about idle hands," Wright added. "They saw nothing to dissuade them from the idea that soccer was the devil's workshop." According to Wright, the Pilgrims had to endure horrifying treatment while in Europe. They could barely travel anywhere without being inundated with images of people hitting soccer balls with their heads, their knees, or even their hips. In an effort to conform, they would often try to watch a game, but, Wright said, this was tantamount to torture for people of such convictions. Though playing in soccer matches went against everything they stood for—especially the right to enjoy oneself while participating in recreational activities—some future Pilgrims went so far as to force themselves to join the endless, scoreless games of their neighbors. "It got to a point where they had no choice but to start a new life somewhere else, not only to escape oppression, but so their children could grow up in a place where they didn't feel like lepers for not knowing or caring about the difference between a red and yellow card." Wright said. "Unfortunately, many Puritan Separatists feared the journey to the New World and stayed in Europe. Many found soccer to be so repressive that they killed themselves."